Best German learning apps for kids. Learning german for children with Shoonya’s app is fun. From learning with fun animations to interactive media, Shoonya’s apps allow children to explore different topics in german and multiple languages in single iOS apps. We will be launching the android versions soon. Please email us at support@shoonyadigital.com if you would like to be notified for the android version. In the meanwhile, please subscribe and enjoy the fun animations in german on our youtube channel. Children, across the world and of all ages, love animals! They view animals as their friends, enjoy them as pets, and delight in dressing them up as they do themselves. Shoonya Farm Animals offers an interactive experience for children to experience all of the above while learning the names of fourteen farm animals in nine different languages: Arabic, English, Spanish, German, Hindi, Marathi, Punjabi, Telugu, and Gujarati. Shoonya Jungle Animals, a new iOS app is here with all new 15 animals! A continuation to Shoonya Farm Animals, it offers an interactive experience for children to enjoy all new 15 jungle animals and learn their names in nine different languages: English, Spanish, German, Arabic, Hindi, Marathi, Punjabi, Telugu, and Gujarati. 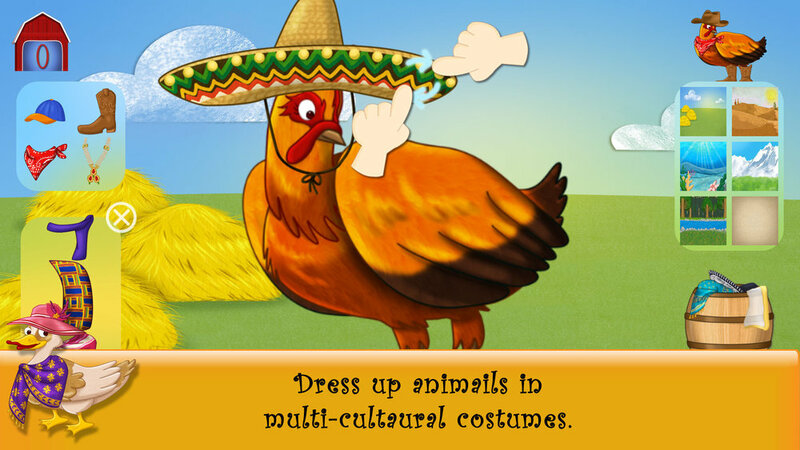 Shoonya Farm Animals and Shoonya Jungle Animals apps offers interactive experience for children to learn the names of fifteen jungle animals in nine different languages: Arabic, English, Spanish, German, Hindi, Marathi, Punjabi, Telugu, and Gujarati. Motive: To encourage children to learn german and gain familiarity with apparel, accessories, and music from cultures other than their own. Each animal name is introduced in a full sentence, along with vocabulary words describing outfits and landscapes. Designed to spark imagination as children dress up the animals with clothing, textiles, and designs sourced from around the world. Created and tested in classrooms to enhance fine motor skills by expanding and rotating the clothing and accessories. Designed to spark imagination as children dress up animals with clothing, textiles, and designs sourced from around the world. English, Hindi, Punjabi, Spanish, Arabic, German, Marathi and Telugu. Each animal name is introduced in a full sentence, along with vocabulary words describing outfits and landscapes. This is an auto play mode with a full immersion technique. Children enjoy fun animations of animal characters created from around the world. Choose german as a desired target language from the language scroll bar on the homescreen and tap on the language window for you to see all the animals displayed in the carousel. A double tap on the age window or a single tap on the carousel slide will start the animations. Motive: Entertain and stimulate the child’s brain at the time when a child’s brain development is at the highest. Research shows that a human brain is hardwired to learn up to three languages by the age of six. One can take advantage of this special window by exposing a child to german and multiple foreign languages through this full immersion technique. Live Animals with natural sounds. Touch to enjoy animal characters with fun animations. Explore animal names in german. Motive: To engage the child with interactive play in german. This is the age when most children are learning to relate animal names with real animals. This mode gives them an opportunity to learn by interacting with the content. They can learn the animals in german along with being exposed to various foreign languages or simply enjoy the fun animations. Designed to spark children’s imagination as they dress up the animal and create their own pet with clothing, textures and designs sourced from around the world. Created and tested in classrooms to enhance fine motor skills while they expand, rotate, stretch the clothing and accessories. Introduction to sentences in german and other languages. Touch to learn various landscapes and simple words. Motive: Encourage children to have fun with languages and explore world clothing, accessories, textures. While every child is unique and their prior knowledge with technology will determine what play mode will will like to interact, this one particularly interests children for fun play.